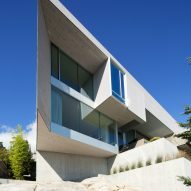 This waterfront dwelling that hugs a rocky hillside, by Canadian firm Mcleod Bovell Modern Houses, is designed to make the most of its sea views. 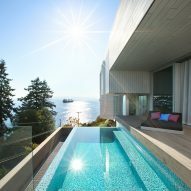 The Sunset House is located in West Vancouver, British Columbia, on a rugged site that looks toward the Salish Sea. 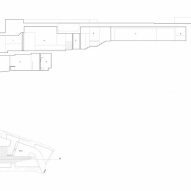 Framing views of the active waterway was a guiding concern for the architects. 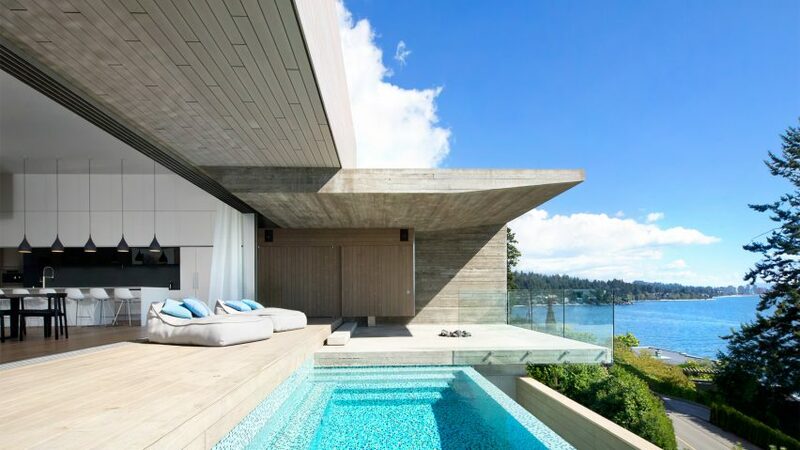 "Situated on a steep and technically challenging site, this single-family home was designed to capture views of the outer harbour and heavy marine traffic along the jagged coastline," said Mcleod Bovell Modern Houses, a Vancouver firm led by Matt McLeod and Lisa Bovell. 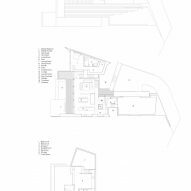 Encompassing 6,300 square feet (585 square metres), the residence comprises irregularly shaped volumes, which are arranged in a way that responds to the contours of the property. An "angled blinder" provides privacy from adjacent homes. 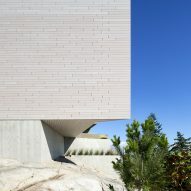 The exterior consists of wood siding and board-formed concrete walls, along with large expanses of glass that face the sea to offer sweeping views. Inside, the team carefully choreographed spaces in order to disguise the significant change in elevation and preserve vistas. To help enable unobstructed sight lines, "no individual stair run is greater than a half-storey," the firm said. 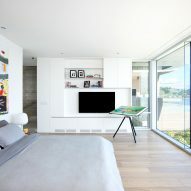 The main level contains the master suite, and an open-plan kitchen, dining and living zone. A large, retractable glass wall opens onto a pool terrace, which is shaded by deep eaves. Situated 40 feet (12 metres) below the deck is a garden. The upper floor contains two bedrooms and an office, while additional sleeping quarters and a recreation room were placed in the basement. The architects sought to create sculpted spaces with a cosy feel. "Due to its concrete construction, the home has a cave-like feeling with carefully carved spaces that feel intimate," the studio said. 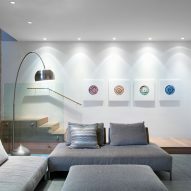 A limited palette of materials was used to establish a calm atmosphere. White millwork was accented with leather pulls and carved wooden handrails, and wide oak planks were used for the flooring. 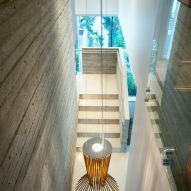 Board-formed concrete was installed throughout the interior, to accentuate rooms and draw a connection to the exterior facades. 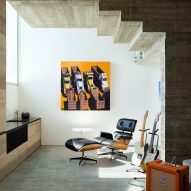 "The palette has been stripped to the essentials, allowing the home to feel cohesive and solid," the architects said. 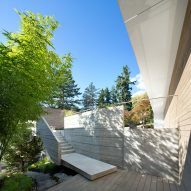 Other homes in the Vancouver area include a dwelling by Measured Architecture clad in blackened steel and wood-textured concrete, and a renovated run-down, century-old residence by D'Arcy Jones Architecture.